Eva Cleaners was founded by a team of professional carpet cleaners with more than 15 years combined experience in the cleaning business. Our goal is to provide high quality carpet, upholstery, domestic and office cleaning services to residential and business customers within the M25 area at affordable price. Most of Eva Cleanerss' work follows from clients' references. 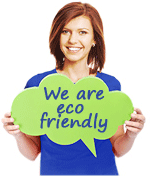 All cleaning products used by Eva Cleaners are 100% biodegradable, environmentally friendly, to produce a safe, clean fresh home at a price you can afford. Our professionally trained cleaning technicians use only state of the art equipment including environmentally friendly supplies. We constantly update our cleaning methods, and equipment to guarantee best result. For a safety purposes for our clients, our cleaning professionals test all cleaning solution pH levels. All our cleaning technicians are fully vettedand insured, with proof of address and referencesand have been trained in the most effective cleaning techniques. Eva Cleaners is the chosen cleaning contractor for many professionals and business owners, in addition to being one of London's most highly respected and privately owned cleaning services. Our professional cleaners cover numerous facilities in London including: apartments, homes, restaurants, office buildings, night clubs, retail stores, warehouses, event centers, and health clubs. Call us FREE on ... to verify our professional cleaners cover your facility! Alternatively you can book your cleaning service online and a member of out team will contact you within few hours. not be a privilege or lux, but affordable for all people.